Description: MOAY past Fitchburg station. Title: EDNM sitting outlawed at Gardner. Description: NS 5357 leading a train west. Description: MEC 350 and MEC 352, the power for train PL-1 today, switch J.W. Green on the Canal Line. Description: MEC 350 and MEC 352, the power for train PL-1 today, pass a puddle near J.W. Green, as the train switches the customer. Description: MEC 352 and MEC 350 sit in the Plainville Yard while a National Eastern Steel travel crane looks on. You can see the steel company's former building to the left of MEC 352, as the company has shut down. Description: RUPO westbound thru Danville, Jct. Description: For the first time ever, two Pan Am-painted units work on Pan Am train PL-1. MEC 350 and MEC 352 do some switching in the Plainville Yard after switching AmeriGas on the Canal Line. Description: MEC 350 and MEC 352 lead train PL-1 toward the AmeriGas facility on the Southington/Plainville town line. Customer Forestville Lumber is seen to the left. Description: MEC 350 and MEC 352 shove train PL-1 across Broad Street on the Canal Line. 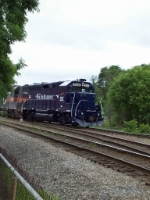 The train is returning to the Plainville Yard after servicing the bustling AmeriGas facility. Description: Train PL-1 switches in the Plainville Yard before proceeding north to East Deerfield, MA. Description: MEC 351 and MEC 350 switch in the Plainville Yard on train PL-1. Once their train is together, they'll be going north to the East Deerfield, MA. Yard.